As part of the Social Justice in Question series, Macalester Professor of Mathematics Karen Saxe gave a talk on Oct. 4 about math’s ability to reveal social realities and predict policy changes. Courtesy of Clara Pitt. In the latest installment in the Social Justice in Question lecture series, Associate Professor of Mathematics and Statistics Jan Cameron hosted Dr. Karen Saxe for a talk entitled “Mathematics and Social Justice” this past Thursday, Oct. 4, in Rockefeller Hall. Cameron brought the lecture to campus in conjunction with his firstyear writing seminar Social Justice in Question. Saxe, the Associate Executive Director of the American Mathematical Society (AMS) and Professor of Mathematics at Macalester College, has received a Distinguished Teaching Award from the Mathematics Association of America and the Macalester College Excellence in Teaching Award. As a female mathematician, Saxe is very active in the community of women in STEM. Saxe is active in policy and advocacy activities with the AMS and the Association for Women in Mathematics, working to connect mathematics with decision makers in other fields to address social issues mathematicians and other scholars face. 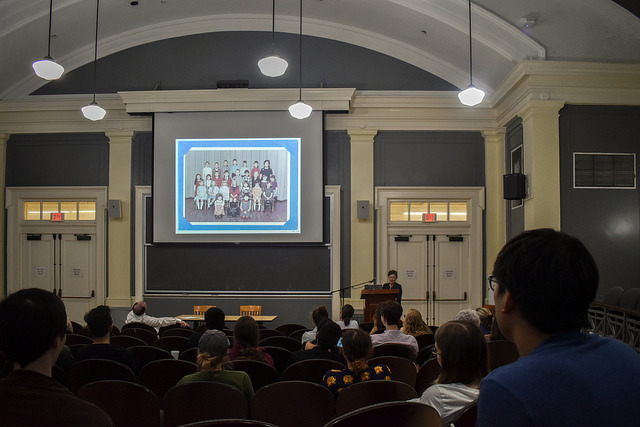 In the lecture, Saxe broadly discussed the connections between mathematics and social inequalities, particularly addressing the different ways for people to get involved in mathematics. The first of three topics Saxe addressed was income inequality. She used mathematical examples and graphs to show that national income distribution is wildly unequal; she then demonstrated the effects of a more equitable distribution of income. Saxe explained, through mathematical formulae, that the United States has the greatest levels of income disparity of all the countries in the Western world. Tied to the social justice aspect of the lecture, Saxe asked students to consider how benefits and available resources affect income. The second topic Saxe discussed was how mathematics can reveal gerrymandering in politics. She first discussed the basic political terms legislators use to draw with voting districts, such as census, reapportionment and redistricting. Saxe went on to indicate how calculus and the ratios of district areas to circles can help in detecting gerrymandering. All of this discussion was used to show students how mathematics can be used to observe the inequalities and injustices in the political institutions in our country. In the third portion of her lecture, Saxe specifically addressed the disparities in educational opportunities, which have been salient points of debate in U.S. politics in recent years. She discussed how fundamental mathematics is to every student’s education, since math is almost always a required subject. Saxe then discussed improved policies to reduce the extreme inequality in the quality of education across the nation.